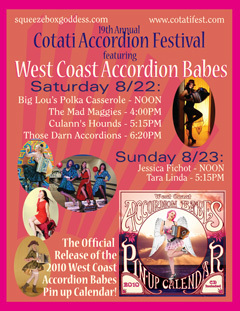 The 19th Annual Cotati Accordion Festival happens in downtown Cotati this weekend. We play Saturday at 4pm and have planned a rowdy good set. 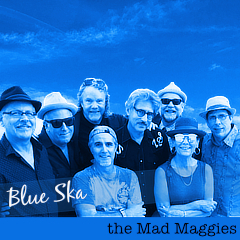 We’ll be a full tiding of musical magpies — 9 crazy musicians in all. I get a little sentimental about this festival because 1991 was the year I fell in love with GDub which was the same year I was given an accordion which also happened to be the first year of the Cotati Accordion Festival. We went to that first festival and I made my public accordion playing debut playing “Lady of Spain” with dozens of other people in the “Lady-of-Spain-a Ring” which included, as it does every year, a release of white doves. Simply magical. This year will be one of the best. Check out the line up. There’s Tex-Mex, Gypsy, Cajun/Zydeco, Tango, Basque, Rock, Irish Punk, Virtuosi, and much more. My advice is to come early and stay late, both days! Buy your tickets in advance to save a couple bucks or pay at the gate. Kids under 15 are FREE! You don’t want to miss this affordable, local, family-friendly, music-rich event. Oh, and we have new red t-shirts with a new design and cool buttons and, of course, our new CD, “Skull & Magpies”.